This amazing self-drive adventure shows you the best Botswana has to offer, including Chobe National Park, the Okavango Delta and even a day tour to Victoria Falls. Botswana is one of Africa’s last great wildernesses and has over 38% of the country devoted to conservation. 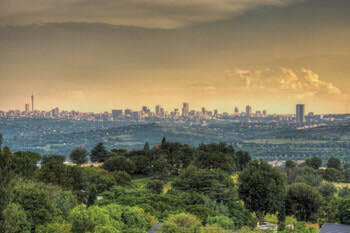 This tour starts and ends in Johannesburg allowing for an optional ‘add-on’ at the start or end of the tour in South Africa. A truly magnificent destination, read on to find out more. 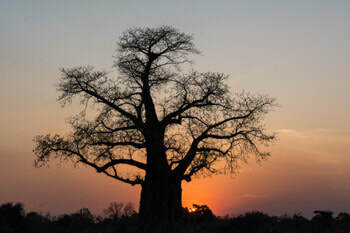 This 18-day tour really allows you to experience Botswana ‘off the beaten track’, at a relaxed pace, on your own self-drive tour. 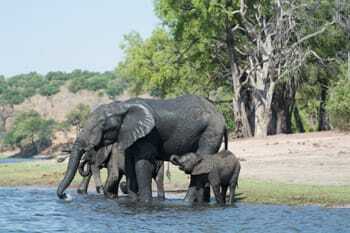 Experience the huge herds of elephant and buffalo in Chobe to the serenity of the amazing wilderness that is the Okavango Delta and the impressive and thunderous Victoria Falls. In a combination of walking safaris, game drives and river cruises you will truly be immersed in the Botswanan wilderness. You will leave feeling back in touch with nature and planning your return trip. Upon arrival at OR Tambo International Airport in Johannesburg, you will be met by a representative of your guesthouse and taken there. Here you can spend the evening relaxing after your flight. If you arrive in the morning, it is possible for us to schedule an activity for you this afternoon. After an early breakfast, your guesthouse representative will drive you back to the airport where you will collect your rental car and begin the journey to the Botswanan border. 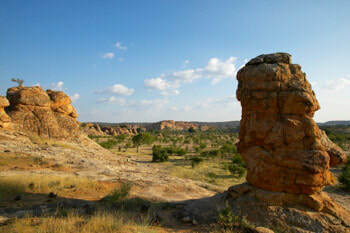 After crossing the border you will drive the short distance to Stevensford private nature conservancy situated on the Limpopo River in Botswana’s magnificent Tuli Block. The reserve is home to many species, including giraffe, zebra, eland, waterbuck, kudu, gemsbok, blue wildebeest, bushbuck, red hartebeest, impala, steenbok, duiker, aardwolf, aardvark, brown hyena, warthog, crocodile, and hippopotamus. 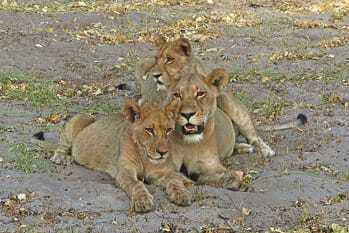 Here you will relax and enjoy a real African bush experience. If time allows, this afternoon you will join a guided bush walk, during which your guide will tell you all about the animals, birds, animal tracks, vegetation and insects. 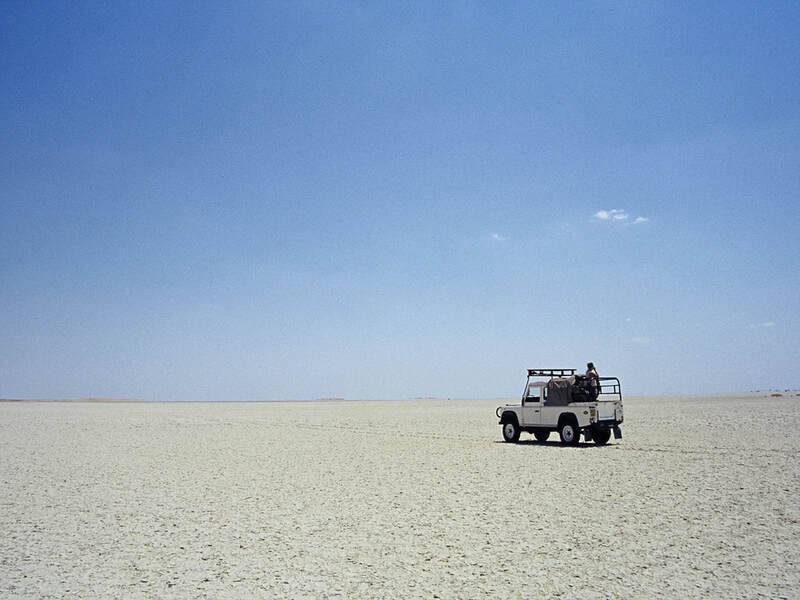 Today is a drive day, you will drive north to Nata Lodge, located on the edge of the Makgadikgadi Salt Pans; the largest salt pans in the world and the remains of Africa’s largest inland sea. The Nata River delta feeds the Sua Pan in the Nata sanctuary and forms the breeding ground for a host of water birds including pelicans and flamingo in their thousands, transforming the shore line into a pink haze. On arrival you will simply relax and enjoy the peaceful wilderness with only the sounds of the some 165 bird species found in the surrounding area. Today you will join a three hour guided tour in an open vehicle into the Nata Sanctuary. 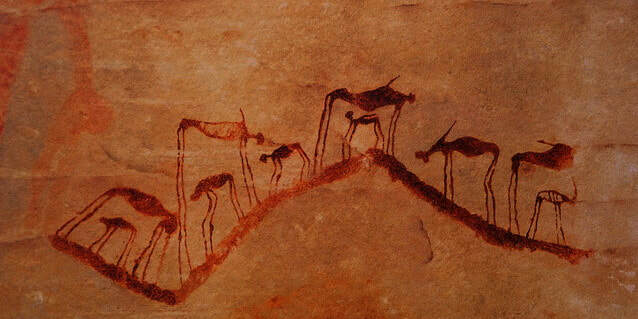 Mammal species in the sanctuary include antelope such as springbok, as well as springhares, jackals and foxes. However, the main focus of the tour is to enjoy the abundance of bird life. Around 165 bird species, including kingfishers, eagles, ostriches, pelicans, spoonbills and both greater and lesser flamingos, have been recorded. Cameras are a must to record this colourful variety of birds. Back at the lodge you can relax and enjoy more birding from the comfort of your pool lounger. There is a bird feeding area and active water feature providing the opportunity of viewing a variety of species including Helmeted Guineafowl, Crested Francolin, Yellow Hornbill, Pied Babbler, Glossy Starling, Meyers Parrot and Paradise Whydah. At night the birds roost and the Bush Babies come and visit the feeding station. Today you will continue your journey north to the magical Chobe River Front and the beautiful Chobe Safari Lodge, located on the banks of the Chobe River in northern Botswana. 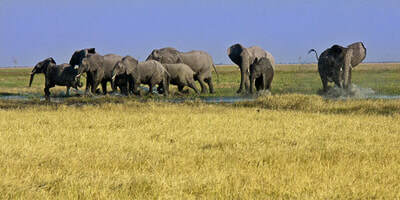 Chobe River is the best destination to enjoy huge elephant and buffalo herds. The river is home to large numbers of hippo and many crocodiles. 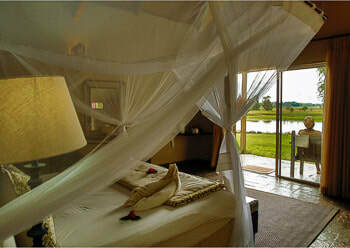 The lodge borders on the Chobe National Park, which is part of the Chobe-Linyanti-Kwando- river system. The series of islands, floodplains and lakes ensure an abundance of wildlife. 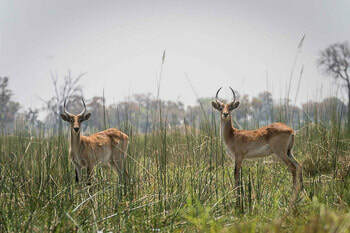 In the dry winter season, the animals move closer to the Chobe River. 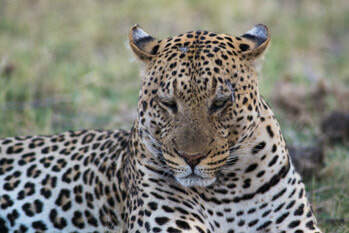 Other plentiful game include lion, leopard, giraffe, as well as puku, kudu and other antelope. This afternoon you will enjoy a river cruise on the Chobe River allowing you to get up close to the amazing wildlife and enjoy sundowners on the river. Today you will enjoy a guided game drive into the Chobe National Park and a private boat cruise on the Chobe River on a smaller boat. 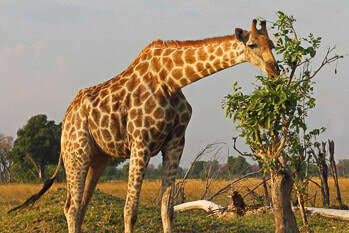 Chobe National Park is one of Africa’s true wildernesses, named after the beautiful Chobe River that forms its northern boundary and protects the 11,700 square km park. The Chobe River flows for 60 km through the park allowing for exceptional game viewing along the river’s edge, both by vehicle and boat. 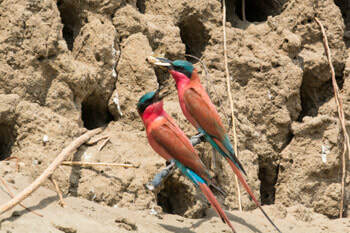 Along with the big herds, Chobe also attracts an array of water birds and raptors that like to nest along its banks. The riverfront is also a hotspot to see hippo and crocodile. 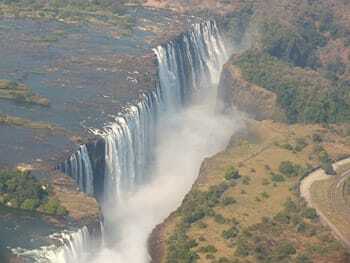 Today you will visit the legendary Victoria Falls. On this day trip, you will explore the mighty Victoria Falls, one of the Seven Natural Wonders of the world. 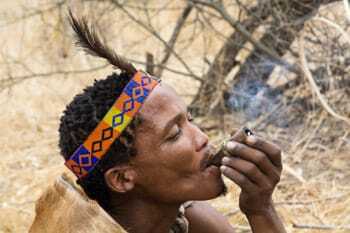 It is found on the border between Zimbabwe and Zambia, on the Zambezi River. Although it is not the highest or widest waterfall in the world, it is considered to be the largest due to its combined width (1708 meters) and height (108 meters), creating the world’s largest sheet of falling water. 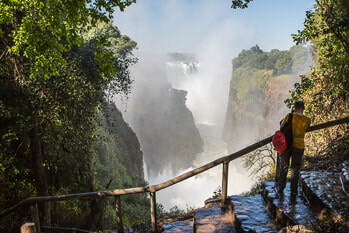 After visiting the falls you can have lunch at the Rain Forest Café or Mama Africa and later visit the falls curio market for some souvenir shopping before returning to Chobe. Today is your day to choose what to do, maybe you simply want to relax next to the pool? If you prefer you can go on another game drive into the Chobe National Park, game drives depart three times a day (3-hour duration). Alternatively, there is an option of booking a full or half-day drive with a picnic lunch. Fishing for the legendary Tigerfish and several species of Bream is also an option, this not only provides an exciting fishing experience but excellent game viewing (crocodile, hippo, elephant, buffalo) and birding as well. All activities today are for your own account. 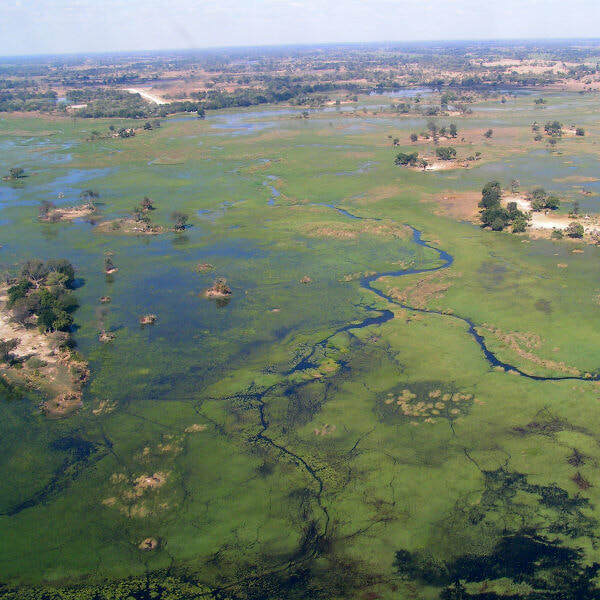 Today you will drive to Camp Kwando in the Zambezi (formerly known as Caprivi Strip), a small finger of Namibia that sticks eastwards between Angola and Botswana all the way across to Zimbabwe and creates the only spot on the planet where 4 countries meet. 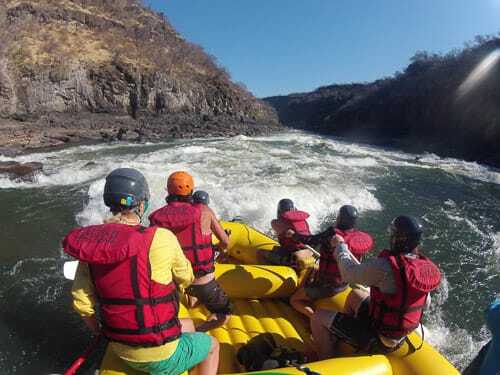 The Zambezi is almost entirely surrounded by foreign countries. The terrain is mostly made up of swamps, floodplains, wetland, and woodland. It is also home to 450 animal species. Beautifully set on the banks of the Kwando River Camp Kwando is centred around a large thatched lapa which houses a restaurant and bar. On arrival, you can simply relax and enjoy the serenity and the views from this rustic African lodge or you can book and join a game drive or river cruise at your own expense. Today you will drive back into Botswana and on to Drotsky’s Cabins on the western Panhandle of the Okavango Delta, this is an original pioneer lodge. The papyrus channels and lush vegetation of the river make the cabins an ideal venue for fishing and bird watching. 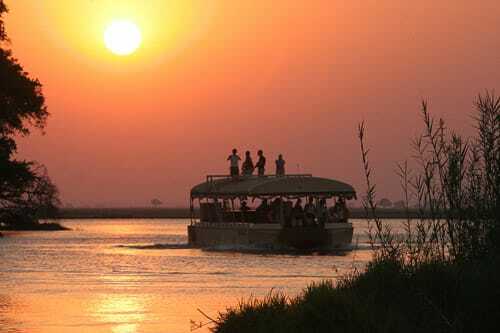 The river boasts seventeen species of fish, most notable are the tiger fish and bream. Apart from many opportunities to view birds and some wildlife of the Shakawe area in Botswana, the rustic lodge also offers a place for rest and relaxation. 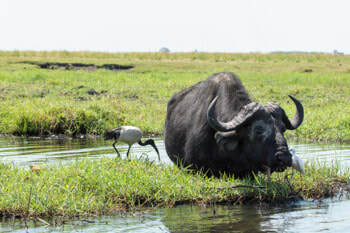 Today you can relax and simply enjoy the birds and wildlife from your cabin or you can book an optional boat cruise on the Okavango River. Bird life is abundant at Drotsky’s, and the staff will be quick to point out their local specials such as the Brown Firefinch and White-backed Night Heron, or the haunting call of Pel’s Fishing Owl. Between August and October visitors can enjoy a boat tour to witness the feeding frenzy or the Barbel run as the fish swim upstream. Today you will leave the Panhandle and drive south to the tourist capital of Botswana; Maun. You will stay at Thamalakane River Lodge, an easy 20-minute drive from Maun overlooking the Thamalakane River. From this destination, many activities and day tours are available making it a perfect destination to spend a few nights. Today relax at the lodge and enjoy the river views. Today you will enjoy a fantastic day trip which starts by boat to the Boro Poling Station, from here you will meet your local polar who will take you out on their Mokoro boat to show you the small and the large wildlife that the Delta has to offer. 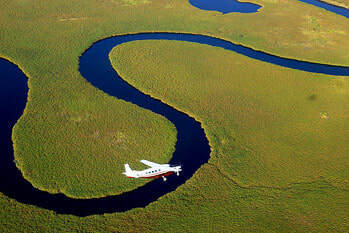 This has to be one of the most tranquil and best ways to experience the Delta. It will truly be a wonderful day where you will become at one with nature. Sit back relax and enjoy the views. Today you can choose what to do. We highly recommend a short flight over the Delta, the flight gives you a full appreciation for the size of the Delta and allows you to see the animals and the pathways that they create through the Delta. It’s a real once in a lifetime experience. 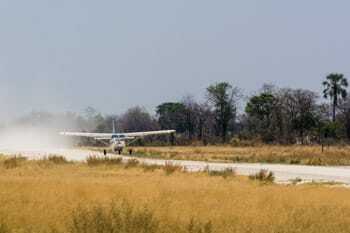 If small aircraft do not appeal maybe you would like to join a full day guided game drive to the famous Moremi Game Reserve. 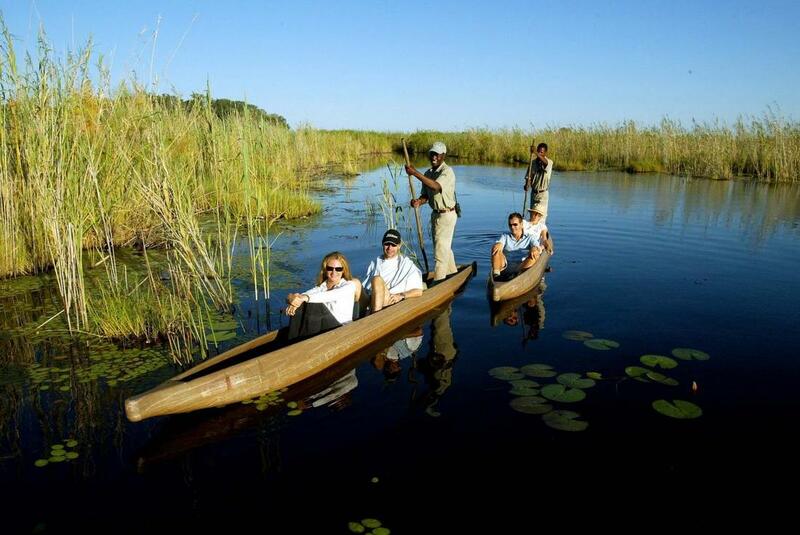 Alternatively, there are boat cruises available from the lodge, or perhaps you would like to go into Maun for some souvenir shopping and to enjoy the hustle and bustle of this very African city. All activities today are for your own account. 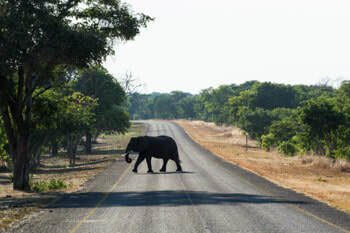 Today you leave Maun behind and travel south to Serowe and the Khama Rhino Sanctuary. The Khama Rhino Sanctuary Trust is a community-based wildlife project, established in 1992 to assist in saving the vanishing rhino, restore an area formerly teeming with wildlife to its previous natural state and provide economic benefits to the local Botswana community through tourism and the sustainable use of natural resources. On arrival, you can relax and settle into your rustic African chalets and once again enjoy only the sounds of the bush. Today you can choose to explore the reserve on a self-drive safari, a map of the reserve can be purchased from the gate and lodge. Alternatively, you can book and join guided safaris through the reserve, the guide will be able to tell you all about the animals you encounter and the conservation projects underway. 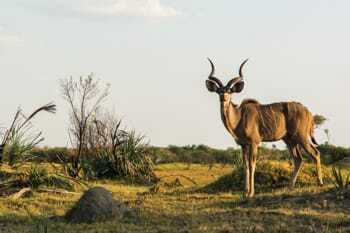 The sanctuary has black and white rhino, giraffe, zebra, wildebeest, jackal, impala, ostrich and steenbok. 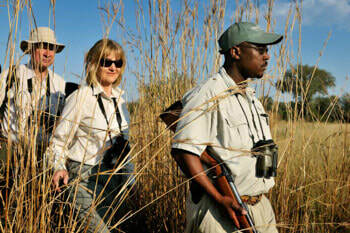 As there are no large predators on the reserve several self-guided nature walks are also available. 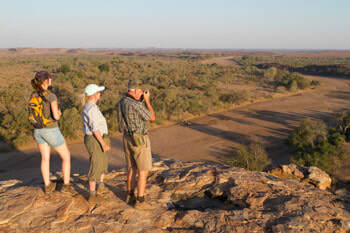 Today before you depart we highly recommend getting up early one last time to join an optional guided rhino walk. 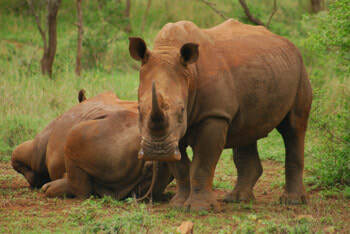 During the walk, you will get to track Rhinos by following on its tracks and learning a few tricks about the wild. This activity is very interesting and is conducted by qualified guides. The purpose of the activity is not only to find the rhinos, but also to learn some survival techniques and habits that these animals have adopted in their evolution. This activity is for your own account. After breakfast, it is time to leave Botswana and drive to the border and south into South Africa. Here you will stay at the elegant Buffalo Thorn Safari Lodge for one last night in the African bushveld. ​If you have time this morning maybe you will do one last optional guided activity, walks and drives are both available from the lodge. These activities are for your own account. After breakfast, it is time to continue on to OR Tambo, from where you will return your hire car and prepare for your flight home. 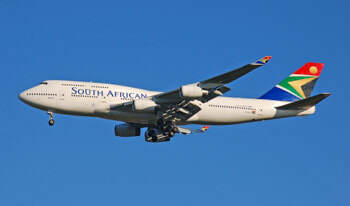 We hope that you have had a fantastic tour and wish you a safe journey. Please note: Accommodation can potentially differ from the establishments mentioned in this itinerary (if fully booked). In such cases, we will look for suitable and similar accommodation. Any changes will be discussed with you. We can only book accommodation after you have confirmed your booking with us. Please note:​ All activities are at the discretion of the guides and camp managers. It might be necessary, due to circumstances beyond our control, that we will need to change the programme. Closing times at sightseeing points, changed flight times, road blocks, detours or act of nature can also delay the programme. We reserve the right to make changes due to circumstance of this nature.